JT McCormick from Houston says: "I'm a member of the Capital Regiment color guard, and this season will be my second marching with one of the newest Division I corps to hit DCI! This picture was taken at Capital Regiment's last laundry day of the summer in Madison, Wis., last year. 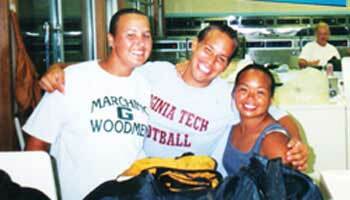 "Left to right pictured are Amy ("Miss Greenwood"), me, and the new assistant colorguard captain for the 2003 season, Kim. "I always knew I'd make friend in corps but I never knew how close of friends they would become. Kim and I marched winter guard together in Houston and came into Capital friends and left as even better friends . Amy is an awesome person who calls me almost every week -- I talk to her more than I talk to most of my family! These people, the ones you meet in corps, truly become your second family and I love them all. I keep each of them close to my heart , especially all of my Capital guard kids! I love you guys!" Thanks JT! View the Forzato archives E-mail your Forzato submissions to dave@dci.org along with where and when the photo was taken, and send some biographical information about yourself as well. We'll give you full credit. Also, let us know if you want your e-mail address included, to get feedback from other drum corps fans.